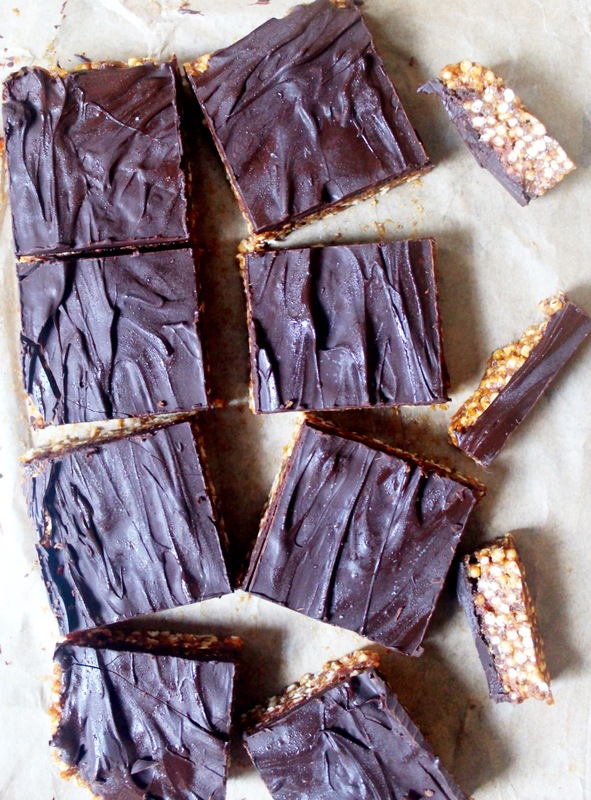 These are like a nutritious version of caramel rice crispy squares, but better! You should be able to get quinoa pops in all good health stores. They have the best puffed texture and they’re packed with protein and fibre and are super light. These treats are pretty hard to beat! Start by pouring boiling water over your dates and leave them to soak for about 10 minutes. Add the drained dates, almond butter and maple syrup to your food processor and blend until thick and delicious. Add the quinoa pops and the date mixture to a bowl and mix thoroughly. Now the sticky bit! Spread the mixture out in a lined baking tin. I used a combination of my hands, a knife and a spoon! Pop it in the fridge or freezer while you melt the chocolate. Melt the chocolate and then pour it out over the bars. 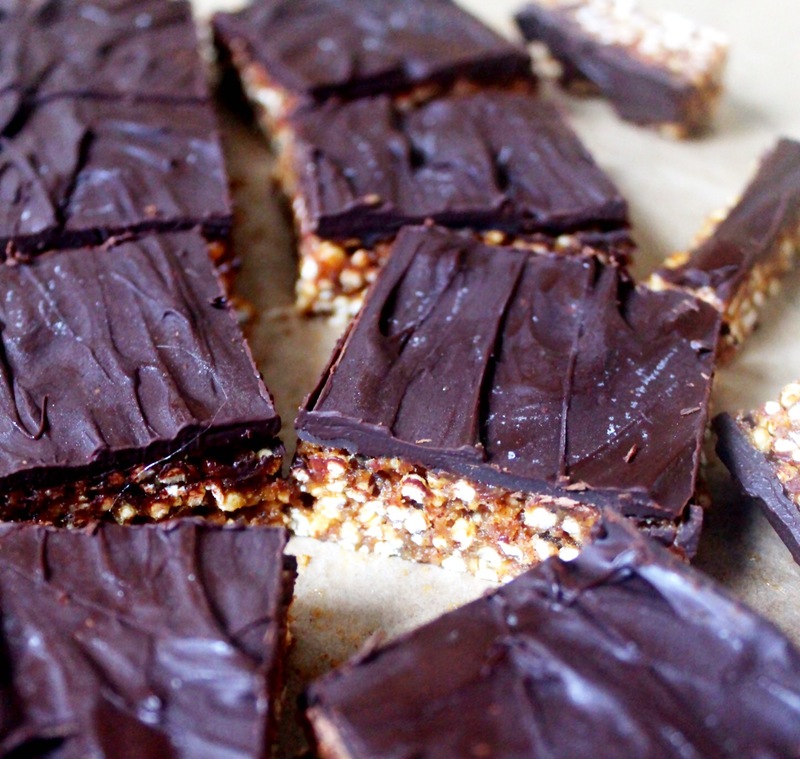 Pop it back in the fridge or feezer until the chocolate has hardened completely and then slice into little squares and serve! *If you couldn’t find quinoa pops you can make your own, the texture isn’t quite the same but they will still be delicious: Just heat a deep pot on medium/high, when it’s hot scatter the quinoa into the pan (only a thin layer, so you will have to do a few batches). Once you hear a few little pops, start stirring them around so that they don’t burn. Take them out as soon as they have popped and started to turn golden, it only takes about 20 seconds and should smell like popcorn! I’ve only ever made them using nut butter, but I would probably just double the dates and agave- I’d soak them for atleast 10 minutes! It should work I’ve made similar things using that method! These look and sound delicious!! I think I might try them with sunflower seed butter! do you drain the water from the dates after soaking? Yep drain the dates and then add them! I made these today but subbed different nut butters as I had no almond in the house. They were divine! Love the blog and have recommended it to so many people! I’m not a fan of Agave. How would honey or Maple Syrup work as substitutes ? i made these using peanut butter and honey both work just as well for anyone wondering 🙂 this recipe is so delicious love it for a little treat!